﻿ What happens after wildlife control exterminators get rid of bats? What happens after wildlife control exterminators get rid of bats? The answer to this question will very much depend on where you live, what species of bat your wildlife control exterminator has successfully managed to get rid of, and how much of a successful job was done on the property. 1 - The building is inspected for signs of bats, bat entry points, bat damage, bat guano, and potential future danger spots. 2 - The wildlife control exterminator will use exclusion devices in the fall on one, two, or three or the larger entry points, sealing up the smaller ones with durable materials. 3 - The wildlife control exterminator will check the exclusion devices over a period of five to seven days/nights. Not all bats will leave the roost on the first night, and they won't all head out to find food at the same time either. This “staggered” job ensures that you leave enough time for all bats to be evicted. 4 - Only when all bats have been evicted will the control exterminator then remove the exclusion devices and seal up the holes, using durable and long-lasting materials once again. 5 - He or she will then go inside the building, checking for guano and other signs of bats. These will need to be removed. Any residual biological matter will attract other pests, including rodents and flies, and could also re-attract other bats, encouraging them to find another place to break in that you perhaps haven't noticed yet. 6 - Bat guano must be removed thoroughly and properly, using a combination of cleaning agents. Poop can't be swept away, but must be vacuumed away. This prevents the spread of airborne diseases, such as histoplasmosis. This process is essential for making sure all bats are removed, and also that they can't come back and cause you a problem again too. Trap them — it is actually illegal to trap bats in most states and it isn't the most effective bat removal solution. It would take you a lifetime to trap and remove an entire colony of bats, one by one or a few at a time. Kill them — it is also illegal to kill bats in most states. Again, this isn't an effective form of bat removal and usually results in many dead bats lying around in the depths of your home that you will then need to locate and remove. By using poison or other killing methods to remove bats from a building, you are, once again, causing more problems than you'll be solving. 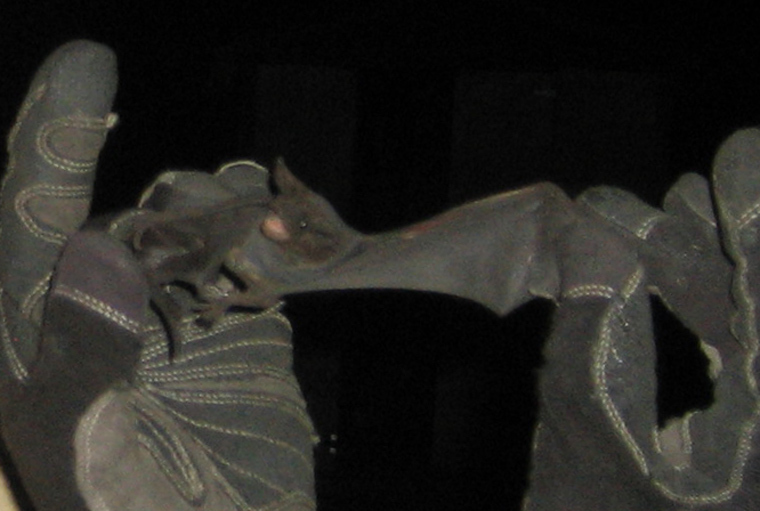 Repel them — there are NO long-term repellents that work to keep bats out. You can use lights to move bats from a particular spot, short-term, but you can't keep the lights on that particular area all the time. As soon as the light is turned off, the bats will just come right back. The same can be said for virtually every rat repellent you'll come across. None of them work. They also don't seal up the building, which means it'll still be vulnerable to nuisance wildlife attacks. Go back to the Bat Removal page, or learn about bats in the attic with my Bats in the Attic guide.